Beyond Navigate To and Call Hierarchy, Visual Studio 2010 doesn't include new search features, but existing features are wildly underutilized. Beyond a simple search, you can Find in Files, Find Symbols, use F3 and Ctl-F3 for the next and previous, and use the quick find box in the toolbar. Find in Files lets you specify the directory to search and the file types. Find Symbols lets you limit your search by platform and create custom component sets for searching as well as supporting both prefix and substring searches. And you can use RegEx in many search dialogs. For example how to create visual studio 2010 project from existing code folders? There are two additional keyboard search tricks. If you select a set of characters in your code and hit Ctl-F3 or Ctl-Shift-F3, you'll navigate forward and back through any matches. If you press Ctrl-I or Alt-I -- depending on your keyboard layout -- you'll enter incremental search mode, and the cursor will change to an arrow and binoculars. In this mode, Visual Studio will refine your search as you type, moving to the next matching value. You can also hit F3 or Shift-F3 to navigate to the next or previous matches. Hitting these keys also ends incremental search mode and places your search text into the quick search box for easy reference or reuse. Now for the caveats: If you move existing projects to Visual Studio 2010 from Visual Studio 2008 or 2005, your platform target is not updated. Visual Studio 2010 supports development targeting older framework libraries to aid in application deployment, but the project itself is altered to become a Visual Studio 2010 project and you won't be able to open it in Visual Studio 2008. On the surface, the changes are just version number variations in the project and solution files. Beneath the surface, there's no guarantee that the structure of supporting data remains unchanged, so consider the move to Visual Studio 2010 a permanent one for your project, and keep backups in case you have a reason to revert. Changes to the workflow of data projects managed from Visual Studio (such as how you load scripts) are significant and may be confusing if you manage databases from Visual Studio. IntelliTrace is a feature previously known as Historical debugging, which is a major enhancement made to the Visual Studio 2010 debugger. When an exception occurs, you usually start debugging with breakpoints set in suspected areas and check variable/object values for correctness. But if an exception occurs when IntelliTrace is enabled, it allows you to just go back in a time of your application execution and find out what events got raised and what were the values of various variables, etc. similar to Call stack like approach. This helps you inspect all the events that finally triggered the exception. This helps in many ways; even you don’t need to worry about breakpoints. You can use Navigate To(Ctrl +,) to search specific methods, class’, etc. in your code. This helps to navigate your code faster, code navigation speed in Visual Studio 2010 is increased highly because of this new feature. This also comes handy when you keep jumping between different methods of your code frequently. In previous versions of Visual Studio, you didn’t have such a swift option. Also, we can click the pin icon next to a variable’s DataTip, and it will stick to your code window for you to drag & place as you like. Remove it by clicking the "X" in the DataTip mouse hover menu. Add comments and notes for a variable by clicking the double down arrow in the DataTip hover menu. We know that, in debugging mode, we can hover our mouse over a variables, objects and inspect, edit and explore it and we call this as DataTip. 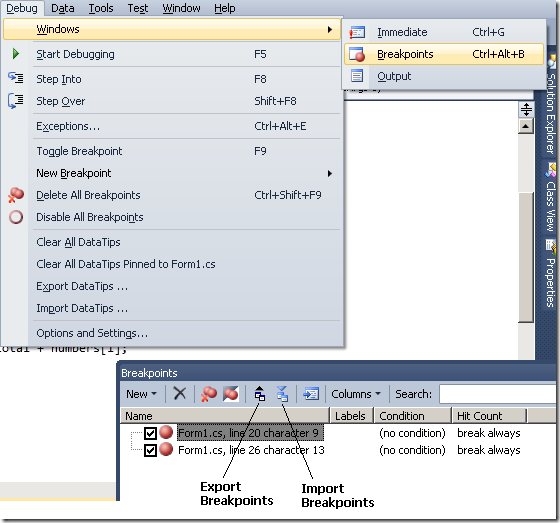 VS 2010, we can stick DataTips to our code window and drag and drop to any place, and the DataTip will hang there. This new feature gives pretty easy view to monitor the variables for your current debugging. Often I see people debugging applications by hitting a breakpoint early in their implementation and then repeatedly using F10/F11 to step through their code until they reach the actual location they want to investigate. In some cases they are carefully observing each statement they step over along the way (in which case using F10/F11 makes sense). Often, though, people are just trying to quickly advance to the line of code they care about – in which case using F10/F11 isn’t the best way to do this. Instead, you might want to take advantage of the “run to cursor” feature that the debugger supports. Just position your cursor on the line in your code that you want to execute the application to, and then press the Ctrl + F10 keys together. This will run the application to that line location and then break into the debugger – saving you from having to make multiple F10/F11 keystrokes to get there. This works even if the line of code you want to run to is in a separate method or class from the one you are currently debugging. Once installed, you may also Disable or Uninstall your plug-ins from the extensions manager. 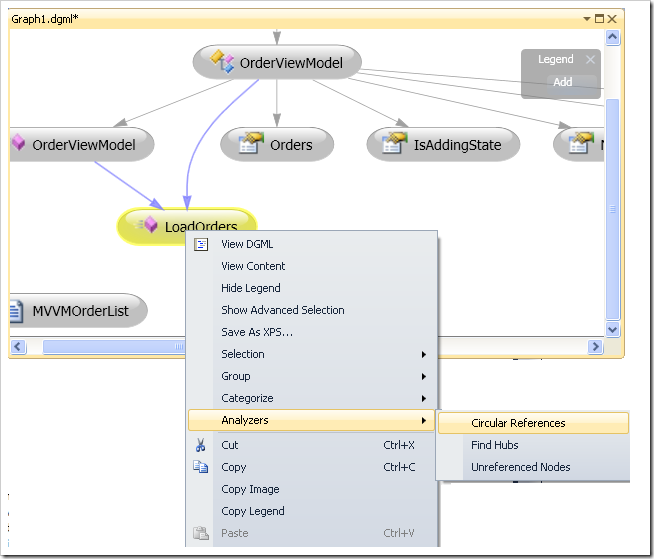 A cool addition in VS2010 is the Architecture Explorer (Click View->Architecture Explorer). The Architecture Explorer will provide you a very friendly interface to browse through and navigate to your solution assets. You can right click on an item (Namespace, Class Name, or Class Member, etc.) and select ‘View Content’ to navigate to the definition as well. 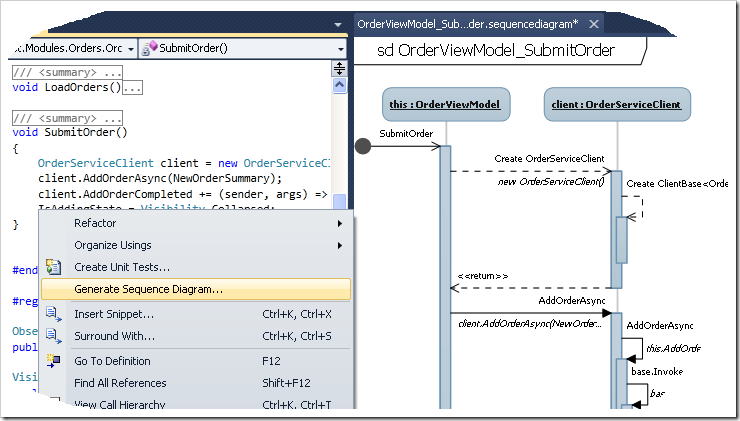 Another cool feature in Visual Studio 2010 is the ability to generate Sequence Diagrams. You may right click inside a method and select “Generate the sequence diagram” from the pop-up menu, to generate the diagram. In this example, you may see that my SubmitOrder method in OrderViewModel class is instantiating an OrderServiceClient, to call AddOrderAsync method inside the same. Tip #87 How to make statement completion transparent Hold down Ctrl key. 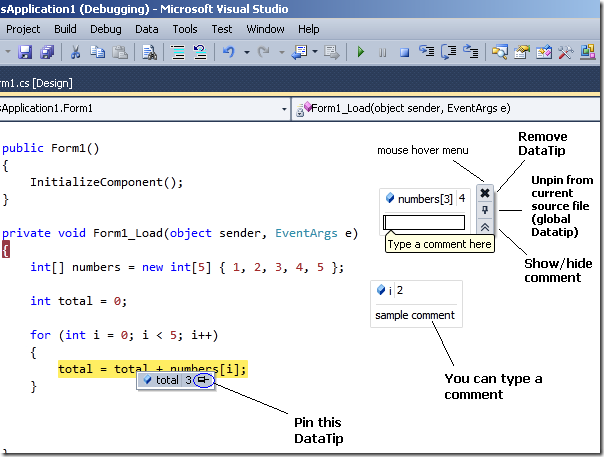 What are your tips and tricks in Visual Studio IDE 2010? Do you understand how to create visual studio 2010 project from existing code folders? Visual Studio 2010 Tips & Tricks. Daily coding improvements best Visual Studio shortcuts. What do you thinks about this tips, what else do you know?